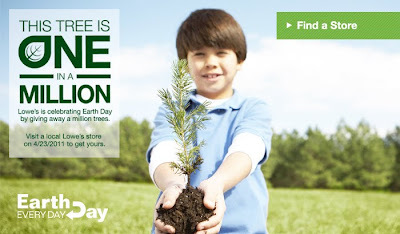 Lowes is giving away one million trees on Earth Day, Saturday, April 23rd, 2011. What a great way to celebrate the day. If you don't have a yard to plant this tree in, then get one and plant it in your mom's yard or your friend's yard or your kid's school yard. Trees, planted in the proper place can shade your house, dropping the temperature considerably and saving you from 10-50% on air conditioning costs. OK, maybe this baby tree won't shade your house this year, bit it doesn't take that long to grow into a proper shade tree. Take a family picture in front of the tree each Earth Day and watch your tree and family grow together. If you don't know the proper way to plant a tree, check out this video by The Division of Forestry. This video shows how to use a tree planting tool called a dibble bar, but you can also just use a shovel. I figure Lowes will run out of trees fast, so go early if you want a tree. One per person. I also suggest you check with your local Lowes to make sure they are participating in the promotion. In case you miss the Lowes give away, check to see if your town has a free tree program. 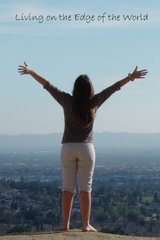 Glendale, California residents can get a free tree by going to the Tree Power Shade Tree Program site.